The next three days, July 6th-8th, Thursday through Saturday we participated in the scheduled preacher and deacon lessons. We arrived at Mt. Zion Church, located in Kumasi where Brother Samuel is pastor, each morning and were greeted by the many Ghanaian brethren from across the country. The lessons that were given by our American brethren during the three days were very uplifting and educational. The topics of our lessons revolved around four broad categories: Preparing for Mission Work, the Call to the Mission Field, Reaching people with the Gospel, and the Relationship between the Church and its Mission works. Within each of these areas, we taught on specific subtopics that we felt were important and pertinent to the sustaining of the churches and missions in Ghana. With the Lord’s help, we wanted to make the lessons as applicable as possible to the brethren present. I was truly blessed to be able to hear the lessons from the other brethren and was fed by His Word as well! We also concluded with question and answer sessions, which is always fun, as the questions varied from one topic to the next. After the lessons on Saturday, Bro. Jeff and I went back to the “White House” to pack a bag and travel up to Atebubu with Bro. Paul Owusu, the pastor of New Covenant MBC, and two brethren that came down for the lessons; Bro. “John” Frimpong Manso and Bro. Frank Sarkodie. The beautiful drive to Atebubu (North from Kumasi) took approximately 3.5-4 hours. Bro. Jeff and I were dropped off at a hotel close to where Bro. Paul lives to get some rest for the evening. The plan was for me to travel north to Prang in the morning to begin revival services at Trinity MBC, while Bro. 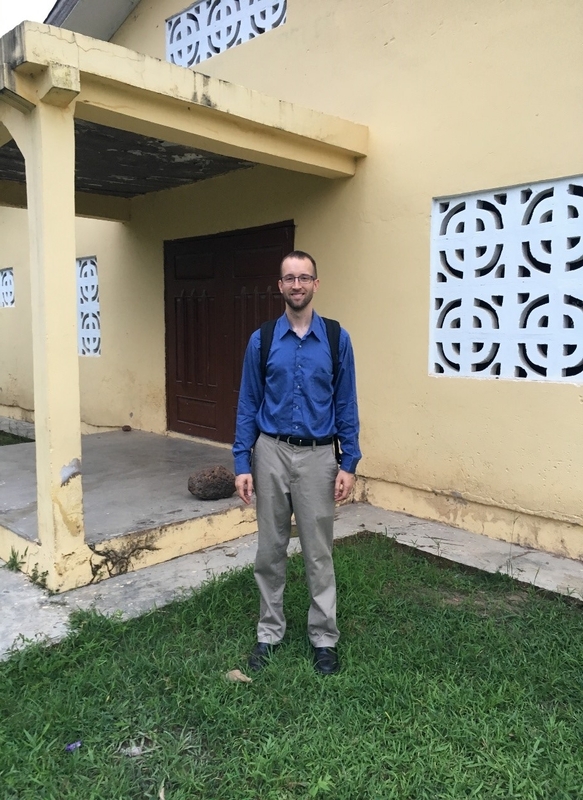 Jeff stayed in Atebubu to preach at New Covenant MBC for their revival services. The next morning, Sunday July 9th, Bro. Frimpong met me with a taxi and we headed north to Prang. I’d guess Prang was a 20-30 minute drive from the hotel. The further away from Kumasi we went, the more the landscape resembled flat farm country. There were more trees, corn and other crops which brought with it the sounds of birds in the area. It was also notably hotter than Kumasi. Growing up in Indiana, I was able to relate to this surrounding a bit 😊. We went straight to the church and were greeted by the pastor of Trinity, Bro. Joshua Appiah. I saw the little room that he lives in at the church and it isn’t very big, maybe about 10x10 or 12x12. Just big enough for a bed and a couple feet to turn around in. It was wonderful to be in a church service with them during the daytime hours. It was nice to be able to see with the sunshine coming into the building to light up the sanctuary. Bro. Appiah led Sunday school, teaching about the Christian’s role in obeying the civil government. It was a good lesson. How did I know? Bro. Frimpong sat next to me and would interpret the lesson as it was being taught. After the lesson, they began to sing songs in their native tongue and upbeat rhythm and then sung a few hymns. I was then introduced by Bro. Frimpong and he remained up by my side as my interpreter for the sermon. I can say that I felt at ease being there at Trinity. It was a smaller church building than the other two that I visited, and much more like the church I grew up in, relative to size. It took me a little bit of time to adjust to this brother and how he was able to interpret, but the Lord helped me in this tremendously. The Lord gave me free course to preach from John 3:14-15 and Numbers 21:4-9. Preaching about Jesus being lifted up on the cross of Calvary so that we might be saved. After I concluded, there were about 8 people that came seeking the Lord. After service, a few of the brethren took me to the hotel in Prang which was only about ½-3/4 mile down the road from the church. I got settled in my room and was able to hang out until the next scheduled service on Monday night. Bro. Appiah stopped by to see me around 5:30pm that afternoon and we talked about the needs of the church. He stated that his wife and kids have to stay in Kumasi due to them not having anywhere to stay locally, or at least not able to financially support a place for them all close to him. He stated that the church would like to build a “missionary home” and have started to stock up on the blocks to do so. 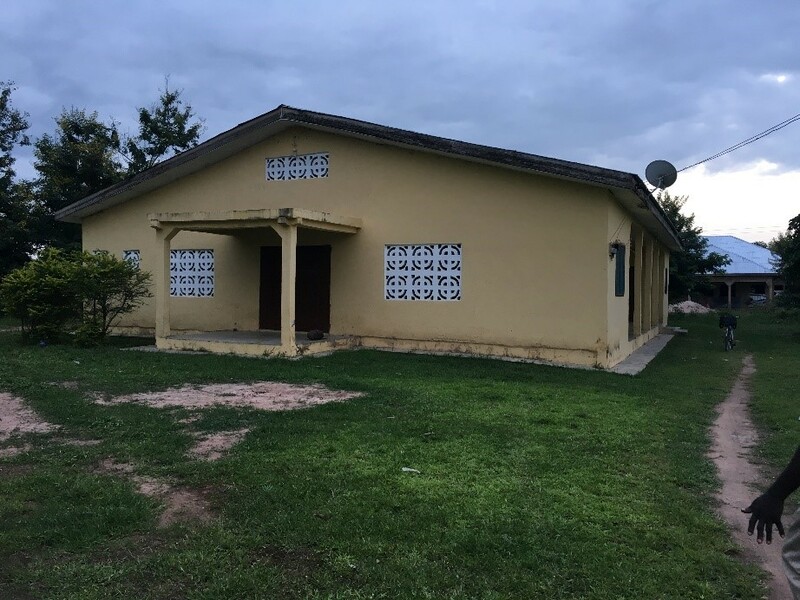 The church owns a large area of land beside the church building and this home would be a place for he and his family to stay as well as have a place for other preachers to stay when they come to the area to help preach. It is now Monday July 10th and I was visited by Bro. Appiah around 9:30am and we discussed more about church topics. I was able to enjoy that day the beautiful songs of birds outside my hotel window and watching the butterflies flocking to the blooming flowers. I didn’t find these simple pleasures in Kumasi due to being in a heavily populated area. I really enjoyed being out in the country. I was looking forward to service that night and was eager to be there! Bro. Appiah came back around 5:30pm to pick me up for service. The church has a mission work several miles away, and they were planning to join us in our services tonight and tomorrow night. We arrived early to the church and I got to sit and talk to a few other brethren before service. They were very curious about what it’s like in America and would contrast that with life in Ghana. It was great to fellowship with them. Service started with singing and praising the Lord. When we began, there were only about 14 people this night. Bro. Appiah said that because it is right after the rainy season, many of the people were so very busy from early morning to late in the evening working hard farming. Due to farming being the main source for not only food, but how they supported their families financially, it was a busy time of year that occupied many of the people that typically attend. As more songs were sung, more people trickled in and the folks from the mission showed up in a taxi van. At this point the church seating was full. Before I preached, the Lord laid on me to sing a song called “Give Me Jesus”. I really didn’t know how Bro. Frimpong was going to translate a song but he ended up waiting till I was finished and then translated what I sang. It is a simple song so I imagine it wasn’t too hard for him to translate. I’m sure it put him in a tough spot there for a minute with me singing and all. I know the Lord was able to use it as only He could. I then read from Psalm 116 verse 5 and from there went to reading the account of blind Bartimaeus. I expounded on being lost from the Lord and that it’s like being blind. I told about how determined he was to get to Jesus to fix his issue. I then went to Psalm 34 and urged those that are lost that He is near to those that are broken and will save those that be of a contrite spirit. I had such great liberty preaching this night. I could just feel the Lord mightily with me. There is nothing better than feeling the Lord’s presence with you while you proclaim the gospel! The next day, Tuesday July 11th Bro. Appiah stopped by in the morning and chatted once again. And again, I couldn’t wait for service that night and it seemed like the day dragged on. The afternoon came and we headed back to the church. Like the night before, I talked to and visited with the brethren and we commenced service. The mission joined us that evening and filled the seats. Bro. Frimpong interpreted for me once again, and I preached what was laid on my heart about the “Good News” out of Proverbs 14:14. I then spoke about the woman at the well in John 4:6-15. There were around 14 people seeking for salvation this night. While songs were being sung and prayers were being lifted up, there were about 4-6 young men who kept falling asleep. What was good was seeing the members that would go and wake them up and encourage them to keep seeking the Lord. It was sad to see this, knowing the condition of their hearts. All I could do is encourage them to pray and to take this opportunity seriously. It’s important to note that just as it is here in the states, there are “chronic seekers” there too. Those who remain lost in their sin who do not repent fully to the Lord. The service ended around 10pm and the mission folks traveled back once again to their homes. There were not any who said that they found the Lord during these few days at Trinity. But, I am confident that seeds were sown and I know that the Lord will give the increase in His time!